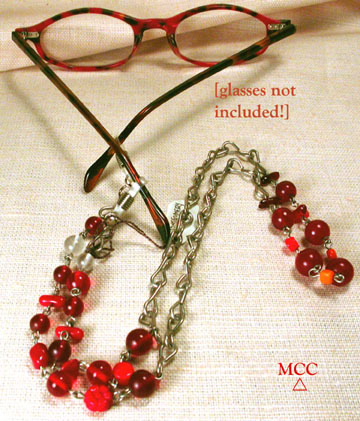 Rock crystal with vibrant reds, wine, and orange juice concentrate orange vintage glass beads complement you and keep your glasses with you...or, detatch the eyeglass loops - we've added an extra clasp - and wear them as a necklace! Combined with oxidized silver chain to 26+1/2" of hand made chic! One-of-kind.